We've known for a long time that Far Infrared Rays were good for certain ailments, yet we didn't understand why. Laying on concrete after running through the sprinklers when we were young, the soothing feeling against our stomach. The relaxed feeling we have after sleeping in a warm bed, the good flavor charcoal or a natural stone gives food off the grill, or the pain free gift given to us by a clay sauna are all benefits of Far Infrared Rays. During research of the heat effect of the seven colors, it was found that the temperature rises when the color is changed from purple to red, and even without color after passing red. This light (with a heat function) was named Far Infrared Rays, or FIR for short. Radiation is one of the characteristics of light and light reaches an object without using the air. For example, the Sun's light reaches the Earth through the vacuum of space by radiation. The second characteristic is the deep impact power. Different from ordinary light beams and short wave infrared rays, Long Wave Infrared Rays can penetrate deeply through mass, including the human body.. Because of this, it can warm our body from the inside out and stimulate many of our body's functioning systems. This third characteristic far infrared rays have an inherent number of vibrations when it is created. They cause vibrations. The vibrations between molecules strengthen and the electronic energy increases. Our body consists of over 80% water and a variety of other materials, such as proteins, hormones, enzymes and nerve tissue which all play their own crucial functions in our health. Long Wave Infrared Rays not only warm our bodies, but they can stimulate those various bodily functions.. When Long Wave Infrared Rays are emitted, they are absorbed by the body and they resonate through it, similar to the sound and energy waves of a bell when it is struck. Perspiration helps regulate body temperature. The Far Infrared Rays penetrate our skin and eliminate waste materials through skin pores. They can promote good blood circulation which may help treat hangovers, fatigue and arthralgia. The evaporation of 1 gram of water takes about 0.6Kcal of heat away; therefore, the role of perspiration is important in controlling our body's temperature. Long Wave Infrared Rays penetrate 14-15cm into the body. Therefore, these rays not only benefit the muscles on the surface of the body, but all cells including blood vessels, nerves, and lymph glands throughout our bodies. These Far Infrared Rays provide a heat source that can relieve shoulder pain, lumbago and the muscle fatigue. Moreover, perspiration helps expel toxins such as urea, nitrogen, uric acid, sodium and chlorine which cause kindney infections and other problems. The generation of Infrared Rays is accomplished by coating a metallic or ceramic surface with a special ceramic material that is mixed with mineral oxides such as silica (SiO2) or alumina (AI2O3). Depending upon the mixtures of the compounds, the surface can generate different wave lengths. When these coated surfaces are heated by means of conventional electric or gas means, the surface produces Infrared Rays. The method of producing Far Infrared Rays is accomplished by passing electric current through carbon. 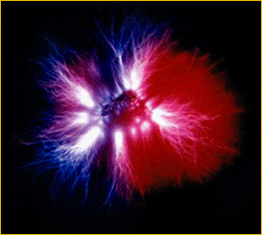 When an electric current flows through carbon, the carbon gives off Infrared Rays. In practice, they impregnate cotton sheets with a carbon compound and let the current flow from one side of the sheet to the other. Here again, the amount of Infrared Rays produced can be regulated by controlling the magnitude of electric current, or the duration of the conduction time by using a thermal sensor. They convert AC into DC first so that the carbon sheet does not generate more than 60 cycle induced current for the user.